Anti cut doors are ideal for the more industrial applications, particularly in situations of limited head and side room, and are certified up to 14 metres wide x 7 metres high. The design of these door makes them especially strong and they are particularly suited for heavy industry applications. 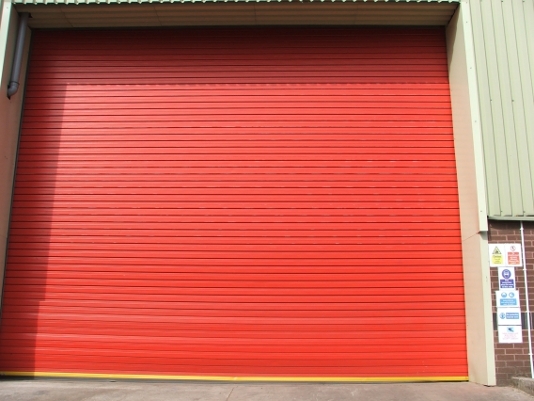 Anti cut doors are designed for use on large, wide openings where headroom is restricted. Each door is custom built to suit the individual characteristics of the opening and the requirements of the client. Doors can fit inside, within or outside the opening, with external canopies if required. Our Anti cut doors will resist severe wind conditions, and can also withstand quite severe collision damage, with repairs being fast and simple due to the purpose designed picket and lattice assembly. This ensures damaged parts which cannot be straightened, can normally be replaced without dismantling the whole door.